Tributes have been paid to a grandmother who died in a crash in Hampshire. 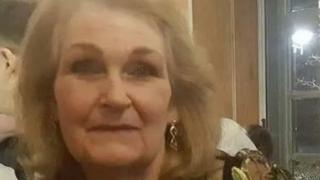 Linda Warwick, 61, from Basingstoke died when the car she was driving collided with another vehicle on the A30 at Hartley Wintney on 24 February. Her family described her as a "much-beloved wife, mother, grandmother and sister". Police continue to appeal for witnesses to the collision, in which three other people were injured. The tribute, released through Hampshire Constabulary said Mrs Warwick's "competence and humanity" was appreciated by everyone who had contact with her. It said: "The sun has left our solar system. We are bereft." The crash, involving a black Audi A4 and a red Suzuki Alto, happened on the A30 at Hartley Wintney, Hampshire, near to the Grange Lane junction, just after 14:00 GMT last Sunday. Mrs Warwick, who was driving the Suzuki, died at the scene. Two of her passengers were also injured - one suffered serious and potentially life-changing injuries. The Audi driver was also seriously injured.